Copper-alloy harness or strap fitting, dating from the late Iron Age to early Romano-British period, c. 100 BC - AD 100. The fitting is in the form of a strap slider, and has a raised bar attached to the back with a rectangular void through which the strop would pass. The artefact is circular in shape and rectangular in cross section. It has openwork design as well as engraved relief work which defines two circles with a mirrored Celtic motif in each. The openwork is in the form of two teardrop shaped voids. These voids do not meet at their points; instead there is a thin band of plate remaining at the centre of the circular fitting. 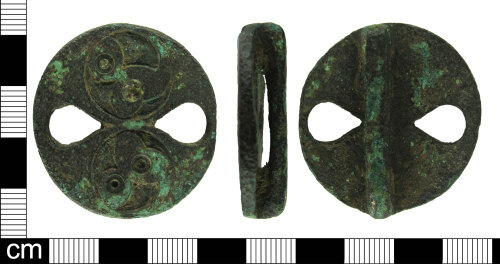 At either side of this band, there is an inset circular design with some raised areas. It is likely that these inset areas once contained coloured enamel. The circular designs are identical and feature curving linear shapes with two smaller incised circles toward the centre. The surface is fairly abraded with a dark green to brown patina. Some areas also show evidence of iron staining, like the attachment points on the bar at the back.